But Republicans are sticking with him. Americans are not satisfied with politics as usual, and they are particularly unsatisfied with the usual politics of a Republican-led US House of Representatives where political careerists maintain their sinecures by doing the bidding of big-money donors, attacking transparency and ethical standards and conspiring to gerrymander their home districts so that the accountability that extends from meaningful electoral competition is denied. According to the latest Gallup Poll, 78 percent of Americans disapprove of Congress, while just 18 percent approve. Since Wisconsin Congressman Paul Ryan took over as speaker of the House in October, 2015, approval of Congress has never risen above 20 percent in Gallup surveys—and has frequently fallen as low as 13 percent. Under Paul Ryan, approval of Congress has never topped 20% in Gallup Polls--and has frequently fallen as low as 13%. That’s a big change from the past. In the fall of 1998, when Ryan was elected to the House—after spending his post-college years as a congressional aide, “think tank” hanger-on and Capitol Hill careerist—approval ratings for Congress got as high as 55 percent. In the years that followed, approval ratings often reached the high 40s and low 50s. As recently as the spring of 2009, when Democrats were firmly in charge of both the House and the Senate and moving on a number of fronts to implement the policy proposals of the new Obama administration, Congress still had 39 percent approval. It has been downhill since then. Indeed, as Ryan’s stature has risen with his chairmanship of the House Budget Committee and then the House Ways and Means Committee (not to mention a bid for the vice presidency), approval of Congress has collapsed while disapproval has soared. Never since 2011, when Republicans retook control of the House, has more than one-quarter of the electorate approved of Congress. 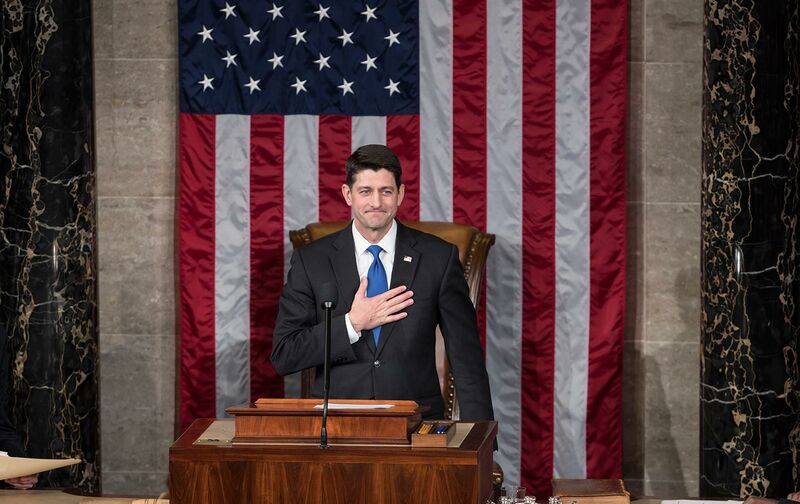 Never since Ryan has been speaker has more than one-fifth of the electorate approved. Yet, as the 115th Congress convened this week, the House dutifully reelected Ryan as speaker. To be more precise, House Republicans reelected Ryan. The fiercely partisan speaker received no Democratic votes. Only one Republican objected to retaining a speaker who has defined the party caucus as an extension of Wall Street (with his ardent support for bank bailouts, crony-capitalist schemes and tax breaks for the billionaire class). Kentucky Congressman Thomas Massie, a libertarian-leaning engineer with close ties to Kentucky Senator Rand Paul and a history of dissenting against Democratic and Republican agendas, cast his vote for Florida Congressman Daniel Webster, who briefly challenged former House Speaker John Boehner in 2015. Folks can agree or disagree with the congressman from Kentucky on particular issues. But when it comes to noting the state of the emperor’s disrobement, Thomas Massie nailed it. Reelecting Paul Ryan as speaker of the House is not a vote for change. It is a vote to maintain the political and economic arrangements that polls say Americans are desperate to upset.